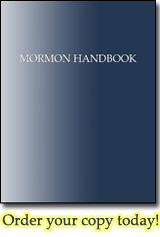 A list of influential people, both Mormon and non-Mormon. B. H. Roberts Roberts admitted Joseph Smith could have written the Book of Mormon. Brigham Young Young was Joseph's successor and the longest serving Mormon prophet. Dr. Charles Anthon Anthon disputed LDS claims that he certified Joseph Smith's translation of gold plate characters. David Whitmer Whitmer stated that Joseph Smith invented the priesthood and subsequently altered revelations after-the-fact. Joseph Smith The founder of Mormonism. Mark Hoffman Hoffman peddled forged documents to LDS leaders. Norris Stearns Five years before Joseph Smith claimed to have experienced the First Vision, Norris Stearns published a book claiming to have been visited by both God the Father and Jesus Christ. The second edition of his book was published in 1820, the same year Joseph claimed he was visited. Thomas Stuart Ferguson Ferguson lost his testimony after spending nearly two decades looking for Book of Mormon archaeological evidences.